You would be well advised to try (at least some of) the various search engines listed on this page, which has been defined as both "a fine tool and a powerful weapon for searchers". Search engines use in fact quite different algos, which gives indexes that do not overlap that much and thus offer searchers the possibility to fish results that they wouldn't even see if they would stuck onto just one index. In other words: if you always limit yourself to google you 'll just cover (far) less than one half of the "visible" web (and probably not even 1/5 ~ 1/10 of the hidden one). This is true even if google offers -as it does- very good precision and failry broad recall (yet check our own relevance comparisons and heed anyway the spamming problems google is subjected to). ..."and the number of individual web pages out there is growing by several billion pages per day". However many of these pages just represent auto-generated content and have NOT been indexed (see "links to unindexed" above). Obviously, if you would really begin indexing and counting auto-generated pages the amount would quickly reach infinite: a large chunk of this "trillion" will be auto-page-generating sites that return a page of junk whatever input URL you try (those same bastards that pollute our searches). Many others will be just login and stats pages. These google's results are just a trillion 'discovered' URLs, not a trillion URLs actually indexed, thanks god. The letter "a", for instance, often used for this kind of "quick checking", gives (april 2009) in google "just" 16 billion pages (or 18 billions... search engines' results vary every few minutes, their "tides" probably depend from the moon position :-) Anyway the "trickyer" a OR a query gives us in google slightly more: 19,330,000,000 pages. This seems to be consistent with google's own hints. Now yahoo, that has a bigger index (in 2005 had already 20 billions), gives nowadays for "a" 43,100,000,000 pages, while the "cool" CUIL, which claims "the biggest index of them all", signs over 121 billions pages! This said -as all searchers know- the quality of the algos is king, while "index size" is -as such- just accessorial. The real problem is always the relevance, coherence and reliability of the delivered results. Again: precision and recall are not the same thing. Despite the previous advice to always use more search engines when searching, there are good resons to get familiar with google's advanced parameters. 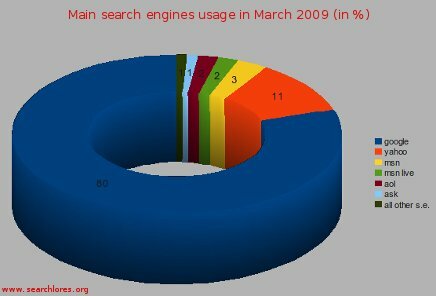 Since the usage of google, relatively to all other engines, has actually further increased (march 2009: google	80% |	yahoo 11% | msn 3% |	aol 2% | msn-live 2% |	ask 1% | all other s.e. 1%, and since google is gaining one percentage point per trimester (no matter what the other engines offer, and we doubt that CUIL will break this hold), we have prepared an in depth, specific, google page that seekers are encouraged to visit. As said, this page is both a tool and a useful weapon, especially when preparing a long term search. Just copy this page (or even better: the quick forms page onto your harddisk as c:\main.htm (or whatever), and then bookmark it there and use it (after having edited or thrown away anything you fancy) in order to perform effective searches on the web using any main search engine and starting from an unpolluted jumping off place, a page that has as few frills as possible and as many useful forms as we know of. A page that you can modify -and ameliorate- yourself (feedback, in that case, would be appreciated). The main reason you should use more than one main search engine is that search engines' results overlap FAR less than you would think. Ad hoc studies point out that around 3/4 of the results of a given search are UNIQUE for each search engine. Remember that search engines list only the first part of any BIG DOCUMENT: the size varies. Google had a famous limit of 101K, which was abolished in January 2005, the new limit should be around 150K. These limits are very annoying when dealing with large documents (or on-line books). Note also that just because one, hundred, or thousand pages from a given site are crawled and made searchable trough one of the main search engines, this does not guarantee that every page from an indexed site has really been crawled and indexed. This shortcoming hits not only 'new' pages, that can take MONTHS to be indexed: beehives of spiders harvesting a site often MISS whole subdirectories, old and new. Useful material may be all but invisible to those that only use 'main' search tools to seek. Moreover anyone that uses regularly google (for instance, but other search engines are not that different) will have noticed how polluting commercial sites results nowadays are. Would a search engine introduce a new, simple "please hide all commercial sites form your SERPs" (Search Engines Result Pages) option, or switch, or slide, it would probably become king of the hill in a couple of months. Therefore, seen the commercial-oriented pollution of the web, you would be well advised to use regional engines, usenet and other specialized or targeted search tools and combing techniques and also to rely on your own bots as well, when searching your various targets. ...should not blind seekers into using only one engine"
"They don't overlap that much..."
Iis index is now provided by Yahoo that bought and promptly crippled altavista 'together with Fast/Alltheweb) in 2004. Read the Altavista in depth page! Spammed as if there were no tomorrow & very badly commercialized. The idiots behind altavista's marketing managed to ruin the best search engine of the middle nineties. It was for a long time THE ONLY search engine which was TRULY BOOLEAN, hence offering truly amazing opportunities to real seekers... (once having taken care of the spam). Altavista algos' main drawback is that they were very easy to spam, so you mostly got useless results in the first 20-30 positions: "hic alta, hic salta" (a seekers' proverb): experienced searchers mostly jumped directly in the middle of altavista's results lists. Altavista became the 'dead links champion' among the 'main' search engines. For boolean operators, and more info, use Advanced Altavista instead! Index now provided by Yahoo. One of Altavista's most SPECIFIC features is the anchor: operator, which will allow patient searchers to find relevant pages trough tha anchor tag. A "Graphical" search engine, rather interesting result clusters. more options To use the best of KartOO, try the cartographic interface. Another "Graphical" search engine by the guys at kartoo, rather interesting result clusters. Here follows a raw text search form, but by all means try its cartographic interface instead! Another "clustering" search engine... associated phrases and related keywords galore! Dicy is a powerful and unique search engine that searches the Internet with a graphical "flower" format and retrieves on the fly users releated and possiblealternative relevant searches. Another "clustering" search engine, from Oz. "Starbust" technique. Original keywords are highlighted. By all means, do click on "next clusters" once you get your first SERP. This is a VERY GOOD search engine, developed by a Hamey guy who's in the "neural network" path. The alpha and omega of all relevant searches. Copied and scraped by all web-thieves and search engines-spammers: real gems lurk inside dmoz. The powerful chinese Google alternative... with CACHE! "...the world's second largest independent search engine..."
Quite commercial oriented... powered by Inktomi... but uses its own databases! "Save, search and share your Personal Web. Furl it"
"Furl saves a personal copy of any page on the Web and lets you to find it again instantly, from any computer. Share the sites you find, and discover useful new sites. Become a member to start building your Personal Web"
Fact is you can use some of the 'comments' this s.e. will dig. This is -for some queries- a very useful search engine, highlights query words in the result snippets and clusters on request results from the same server. Check it! This is not only a -powerful- search engine, but also an incredible stalking tool! Explore the Net as it was! Yahoo is now one of the three "big players" (google, MSN and Yahoo) and claimed at the beginning of September 2005, to have indexed 19 billion sites (against google's 8 billion). A few weeks later Google claimed 25 billion docs (against Yahoo 20 billion). Yahoo had indexed in March 2009 more than 50 billion documents. In July 2008 google stated "being aware" of "more than a trillion documents". Note that there are some direct addresses for yahoo (see google's UF, point 14), for instance: http://216.109.117.135/search. Excite is a classical example of just another 'ignoble corporate merge'. Just click on the link above and look at it! See? Idiotical & useless, obsolete (late-ninety) 'portal' approach. As a consequence it ceased to be a major player since January 2002 (when "Infospace" killed it injecting tons of paid -and hence bogus- search results). This applies to all mergers btw: attempts to escape the fate of pyramide schemes always forebode catastrophes. The Italians and Germans @ Tiscali have tried to revamp this "engine on the sunset boulevard". 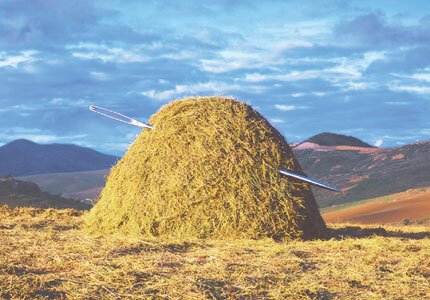 It is still full of pay-per-click crapola, though, so few searchers in their right minds use it. 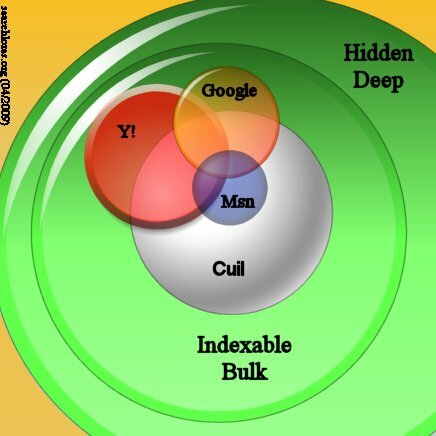 The biggest index seem to belong (April 2009) to cuil (circa 120 billions), followed by yahoo (circa 50 billions), google (circa 20 billions), and MSN. Booleans: AND OR NOT & quotes ""
A "visual search" engine, still in beta, part of Lycos. The refine option is in-built: the SERPs (results pages) organize the information by vertical columns of refining significance (if available). Sometime the results are kinda weird (rapidshare gives one column "cindi sexonthebeach" for instance), but they offer two options: "more" and "related". There's also an "integrated history feature" for unwashed that don't know how to open a link inside a new tab. Here the bla bla: "Launched in "early beta/late alpha" mode on February 2009 after stealth development in Bangalore, Delhi, and London, Yauba is based on over 25 years of cutting edge research from the Indian Institutes of Technology, the University of Delhi, the Massachusetts Institute of Technology, Harvard University, and the University of California at Berkeley"
Results seem not bad at all. Granted, not always as deep and relevant as some other main search engines, but quite promising for a relatively low financed attempt. Algos as yet unstudied, we will see. Privacy claims: "ensures absolute privacy and doesn't collect any personally identifiable information (visited websites, search history, IP address, physical location... etc.) on its users. All records are automatically deleted from yaouba's servers" are not verifiable, but would be an added bonus... if true. Has an anonymous automatic proxy service: click on results to directly visit any external site or click the green "Visit anonymously" link to browse them anonymously through Yauba's own proxy servers. Seems also useful as engine for a quick evaluate with your eyes (and similar related "zen-searcher feelings") sessions. As "visual" search engines go, not bad at all I would say. A "visual search" engine, with BIG snapshots. Quite interesting. Most useful for the quick evaluate with your eyes (and "zen-searcher feelings") session: the results are far from perfect, but browsing the snapshots can be useful, especially when exploring the web in order to quickly eliminate what you surely do not want. About their index, Randy Adams, boss of searchme.com, wrote that "we have about 60 billion pages in our link index with about 2 billion active". A very nice aspect of their very big snapshot collection is that you can bypass the site authors completely, e.g. checking past content (if you check quicker than searchme's reindexing bots) and that such approach still represents a full legit "fair use" of the web, with bona pace of the beastly SEOs and other assorted paranoid patent & copyright lackeys (same spit-pot scrapping morons that whine and snivel "against" cached pages, btw). In fact the biggest appeal of this specific engine is exactly their "big snapshot" + "relevant text" offer. Note that there is a "searchme lite" option, with less graphic frills, smaller snapshots and of course more speed when searching. Yet the decent size of the full sized (not lite) searchme engine, which allow you to actually READ the text, can allow a far better evaluation and seems more useful for the educated seeker. There's an obvious trade off between "speed" versus "evaluation depth", though. So try both "searchmes" and judge by yourself. This was a very thorough search engine until 2005, deemed quite good by most seekers (a rare compliment). It was for instance the only search engine that did offer meta tags in the results list, it also offered a "ip numbers" search option and many more advanced parameters. Unfortunately gigablast was idiotically "downgraded" and thus simplified into uselessness. Decadence of the web? Just compare below the old search mask and the old options (now not working anymore) and the new, working but "moronized" search mask. Note that the advanced search page doesn't work but still exist. Equally ineffective are now the "age within" restriction parameters visible at http://www.gigablast.com/. Gigablast still has a useful cache and it gives the publishing date of the resulting pages (and their dimension). Its "giga bits" feature offers some clustering as refining option. A graphical map of incoming and outcoming links, still in beta, uses google. "A good index & old teoma's good technology. Using its "DATE RESTRICTION" params you can squeeze some relevant results"
This was the old askjeeves search engine, started in 1997, that went through many changes over the years. In the fall of 2001 "Ask Jeeves" purchased teoma's "à la combing" search technology and incorporated it into askjeeves (teoma's forte was mainly "Subject-Specific Popularity" whereas e.g. links to a searching site from other searching sites have more weight than links from -say- cactus owners). As usual with all stupid mergers, askjeeves first crippled -and then in 2006 definitely killed- teoma. The askjeeves name went also back to "ask". Hence ask uses "Subject specific popularity" to organize the web into cluster topics. Also it did retain some meta search engine aspects: some answers coming from dogpile and about. "Our ExpertRank algorithm goes beyond mere link popularity (which ranks pages based on the sheer volume of links pointing to a particular page) to determine popularity among pages considered to be experts on the topic of your search. This is known as subject-specific popularity. Identifying topics (also known as "clusters"), the experts on those topics, and the popularity of millions of pages amongst those experts - at the exact moment your search query is conducted - requires many additional calculations that other search engines do not perform. The result is world-class relevance that often offers a unique editorial flavor compared to other search engines." +last%3Aweek +last%3A2weeks +last%3A6months +last%3A2years and so on parameters ("%3A" is just ":"). There's also an ask for kids portal, that uses natural-language technology that allows kids to ask questions, such as "Why is the sky blue?" or "What's it like to live in space?" Ask has also its own (fairly slow but rather good, be patient, it is worth it) pictures and news search engines. You may also be interested in an older essay of mine: Learning to transform questions into effective queries, where I examined some Ask Jeeves related problems encountered when "phrasing web searches in the form of questions". "The biggest index of them all"
"Add to the huge index: content -rather than popularity- and no snooping"
"A bunch of disgrunted google database programmers with a lot of republican money behind them"
The points above might be true or not, yet this interesting and fairly recent (Mid-2008) search engine claims to have the biggest index of the web (april 2009: 124,426,951,803 web pages: "So far, we have crawled 186 billion pages and have included 120 billion in our index. We continually index more pages"), to disdain the "popularity" parameter (...would be about time! ALL search engine should/must move on such a path, as we continue to advocate since 1999... after all: who would ever care about what the zombies in -say- Arizona are drooling about?) and, finally, NOT to collect personal users' info. When this engine went public, in late sommer 2008, it was snobbed by many (self-appointed) search-experts because it lacked most important finetuning parameters (à la allinurl:) and because the relevance of its results was dubious (to say the least). Things seem to have changed a little, however, and imho the results now offered by Cuil are on par (and at times better) when compared with all other main search engines, especially -but not only- for broad queries. Granted, CUIL doesn't really seem to offer any big advantage because of the (alleged) huge index, has some ridicolous bias (gives seldom results from wikipedia, for instance, which is ludicrous) lacks advanced boolean and finetuning parameters, which is very bad, and doesn't have any vertical "images" or "news" clustering option (which, while annoyng zombies, is after all quite irrelevant for seekers). Moreover its index seems pretty slow in updating... to be quite frank it looks at the moment rather stale, especially if compared with the obviously more dinamic indexes of all other big search engines. They write: "We think that if you are interested in content rather than popularity, you'll find our approach more useful". We'll keep a keen eye on this promise. huge index, content rather than popularity and no snooping. As a matter of fact, CUIL's index seems indeed big: a search for the letter a gave in april 2009 121,000,000,000 (121 billions) results. Unfortunately this is -as usual with index claims- hard to confirm: only around 20 result pages are really viewable, beat's me why. So the approach for a seeker, with cuil, is the usual "refine, refine & then refine again" (and cross your fingers in the mean time). Another serious problem with cuil, as stated, is the fact that they don't offer any advanced boolean (nor even the most common search refining parameters). So if you for instance put quotes around the terms of a narrow multi-term query you will probably fetch just few results, if any, despite their alleged hyper-huge-biggest of them all megaindex. "The most awful colors of any web-search engine"
You can still visit the ad hoc, if obsolete HOTBOT section of this site in order to see what it was capable of. The powerful Amazon Google alternative... with RESULTS + IMAGES + Books extracts! WARNING: Fast is being killed by Yahoo (it's infact dead since March 2004: they nuked most of the cool advanced search features Alltheweb had, like the reverse IP search). FAST's [Advanced Search] is truly amazing and second to none. Ex-AndoSearch, at Alexa, tries to have exactly the same query syntax as google's, the biggest difference is the field restriction options. AndoSearch Query Syntax. AndoSearch Parameter Help. A fairly recent, possibly interesting "vertical" search engine by Eurekster. As such, collaboration between groups of people with similar interests using a swicki will quickly produce much more relevant, tailored results for that group than a generic search engine"
Results are not that bad after all. For instance "advanced internet searching"
A lot of crap subset options (inter alia "Celebrity Gossip"	"Home Repair" and "Parenting Sites", gosh) and few (if any) real parameters you can modify. The crap options themseves send parametrers like 5630 for "Reference" and "5784" for "Health". This is quite interesting because it opens a reverse door to the individual "subvertical" rollyoers. See for instance the difference between a search for "orange" on the different subsets: orange &sid=682 ("web design and standards") orange &sid=3782 ("blogging google") orange &sid=5784 ("health") orange &sid=27682 ("boutique search"). So 791 is "Ipod", 1952 "Matthew Gifford" and 2999 "Ruby on rails". Feel free to experiment :-) but don't forget to use Opera's "block content" feature to kill once for all rollyo's annoying advertisements. Else global results are mostly tantamount to yahoo. A very good and interesting search engine. Its "date:" operator is very useful. introduced by a slash ('/') character. Plusses: It's quicker than google (a lot) and had three interesting "sliders" (more below). Minusses: its index is smaller than google's and yahoo, is noisier and (has less relevant signal) and staler than google, its 'images' search is very poor. To avoid being annoyed by excessive and rather useless location attempts, chose -say- "zanzibar" as your location and always use the US global settings. Still do not underestimate thi engine, it offers some very interesting results. in order to have a 100% match, a 90% popularity and a 80% "freshness" on an "advanced searching" query. The question is, which values should you use? because the first one (match) set to zero will ENABLE the two subsequents ones, where you can kill that silly "popularity" (how many sites link to target (as if anybody in his right mind would care), and give weight - instead - to freshness. or, on the contrary, choose &ADLT=STRICT to implement it. "We have also added a number of new operators that will enable you to narrow your search to exactly what you are looking for. We have added FileType:, one of the most asked for operators, which restricts documents to a particular filetype. InAnchor:, InURL:, InTitle:, and InBody: are now available to find keywords in a particular part of the document, or in anchor text pointing to a document. We have augmented the Link: keyword that finds documents that link to a particular page with LinkDomain:<domain>, which finds documents that point to any page in a domain. Finally, we have added a new experimental operator called Contains:. Contains: returns documents that contain hyperlinks to documents with a particular file extension; for example, contains:wma returns documents that contain a link to a WMA file." Actually this search engine is not that bad, not as crappy as you would expect from Microsoft programmers... but it is indeed quite commercial infested. It is target - basically - for "AOL type" lusers and commercial zombies, and uses therefore the Inktomi indexing services (infamous for its PPC - Pay per click - schemes). Quote: "For research, they are useless, but honestly, how many people that need to do research on the net would really use MSN? AOL? IWON?"